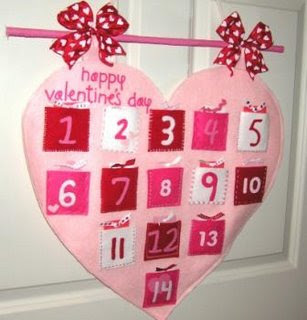 So, I've already showed you my version of a Valentine's Countdown Calendar. But, there are some other cute ones I wanted to feature. I found this cute advent calendar over at Katie's Nesting Spot. She provided a tutorial on her blog. And how about this Muffin Tin Advent seen on Studio 5 . Pioneer Party in Lehi, Utah created this project. 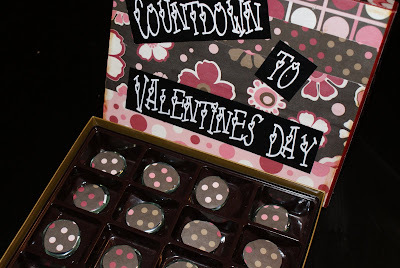 Somewhat Simple recycled this chocolate box to make a fun Vday countdown. She provides a tutorial on her blog as well. Valentine's Day is less than a month away...have you decided what all you're going to do? 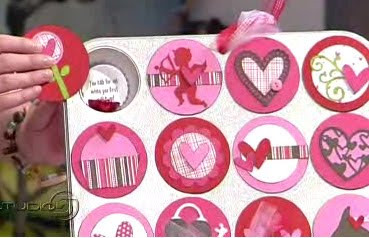 Don't forget about the fun Valentine's Checks that I'm selling as a customized, unique Valentine's gift that your spouse will LOVE! You can find them in my boutique by clicking on SHOP above on the menu bar. Oh, have you voted for Love Actually yet on MomBlogs? I'm almost to the Top 25!! And, don't foget to enter the *giveaway* ending Sunday!! These are so cute! I have some things planned still gathering ideas - thanks for another one! These are adorable ideas! I love the muffin tin idea! Your blog is so informative and clever, the pictures are so beautyful. Can't wait to try most of your recent posts. I intend to stop by again! Our blogs are semi-similar; I'd love your feedback about mine, if you have a sec! I love this ideas! I am going to make one of these for my husband and I to do this year! Thanks for such a fun idea.